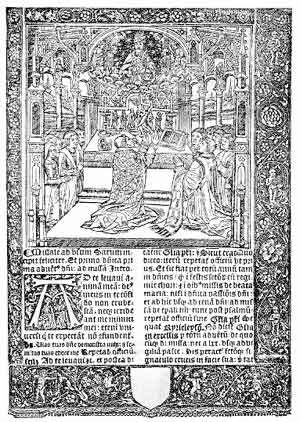 The Sarum Rite was the liturgical form used in most of the English Church prior to the introduction of the first Book of Common Prayer in 1549. Like most of the liturgies of the Church at that time, it was extensive and complicated. It takes only a short study of it to appreciate Archbishop Cranmer's criticisms of it found in the Preface of the 1549 Book; for example: "... the number and hardness of the rules called the pie, and the manifold changings of the service, was the cause, yet to turn the book only, was so hard and intricate a matter, that many times, there was more business to find out what should be read, than to read it when it was found out." There were a number of books required for all the liturgies. The priest's part of the communion service, or mass, was contained in the Missal, which is given here. The Mass also required a book for the choir, and another which gave the unique parts for each day; not only did the lections change from day to day (as they do now), but there were also many other differences (prayers, etc.) from one day to another. The Missal was divided into two parts: the Ordinary, and the Canon, the latter corresponding approximately to the Eucharistic Prayer we know today. The Canon was fairly similar among the three or four Uses employed in England; the Ordinary less so. Although this Sarum Missal was one of the main influences on the 1549 Book of Common Prayer, one will see in it far more differences than similarities. 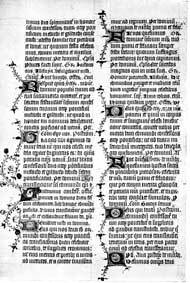 While the general outline of the service, and many of the prayers of the Canon are quite similar, many other parts, particularly the rubrics invloved with the priest's actions, were drastically changed and simplified. We present here two versions: one in the original Latin, and an English translation. The Latin was taken from three sources: The Ancient Liturgy of the Church of England, by William Maskell (2nd ed., 1846); A New History of the Book of Common Prayer, by Procter & Frere; and A Priest to the Altar, by Peter Goldsmith Medd (5th ed., 1910). These sources were not always identical, particularly in the rubrics; in those cases the text given by Maskell was usually taken.